where lins is taking on cooking as her latest challenge & is gracious enough to host a virtual recipe exchange, with a different theme each week, on her site every monday. is having us over to her place! it’s great, because the best part about good food? sharing it! so hop over there today and check out all the great seafood recipes! but first, check this out. what we have here is the freshest take on tacos we’ve had in a long time. bright citrus in the shrimp, salsa & crema + a little kick…these are a refreshing dinner you’ll actually look forward to on these days of triple digit heat. 1. preheat the grill, or a grill pan, to high. 2. toss the shrimp with garlic, key lime juice & olive oil. season with salt & pepper to taste. grill for 1-2 minutes per side, until the shrimp turn pink & opaque. set aside until tacos are ready to assemble. 1. combine all ingredients & set aside until tacos are ready to assemble. 1. warm the corn tortillas. we do this by heating them in the microwave, covered with damp paper towels & plastic wrap. heat until soft & pliable. 2. add grilled shrimp, a scoop of salsa & top with crema. 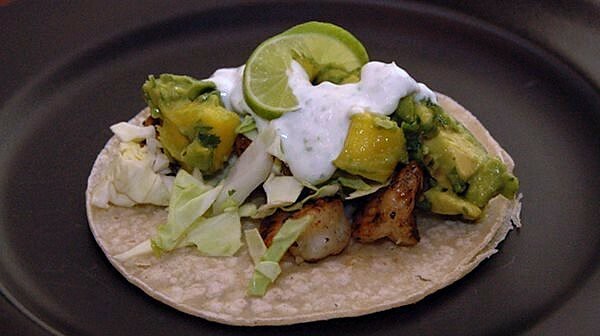 This entry was posted in entrees, seafood and tagged easy, lime, shrimp, sour cream, tortillas. Bookmark the permalink. OMG, this looks awesome! LCW has been known to cook me shrimp before…but this looks great! I can’t believe those land lubbers who don’t eat sea food…dah well, more for us! BTW, dig your theme. I can’t believe she had to add chicken to the category!! The two don’t even compare! These look delicious! Too bad I’m allergic to shrimp.